Ever wondered what Jack Palance would look like as the Punisher? Or who would star in 1950s production of the X-Men? 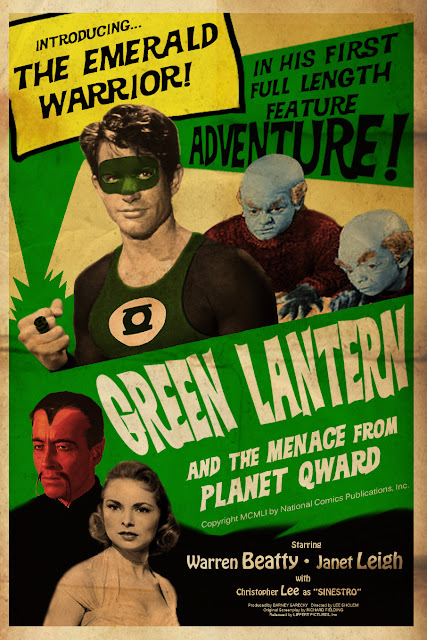 Then check out Sean Hartter's Alternate Universe Movie Posters! Great fun! I've been inspired by his good work (and by the upcoming Green Lantern movie) to try and create a '60s movie poster of my own. And yes, I know Gil Kane used Paul Newman as the model for Hal, but I happened to come across a picture of Warren Beatty that just seemed perfect. WARNING! 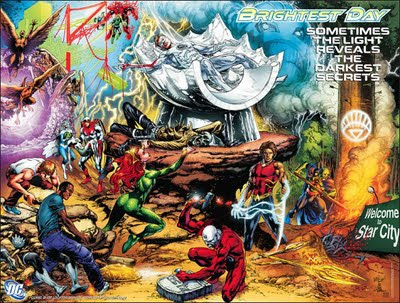 CONTAINS SPOILERS FOR BRIGHTEST DAY! Geoff Johns and Peter Tomasi's year long maxi-series, Brightest Day has come to a finish. In April 2010 we were presented with twelve characters brought back from the dead. Each had been given a destiny to fulfil by a mysterious White Lantern. The series went on to focus mainly on the adventures of Aquaman, Firestorm, Martian Manhunter, Hawkman, Hawkgirl and Deadman as they struggled to fulfil these destinies. Was it any good? When viewed as separate story arcs that reintroduce the characters to us and set up a new status quo for each of them, Brightest Day does pretty well. On the other hand, when viewed as a coherent story in its own right, the series fails. While the arcs of Martian Manhunter and the Hawks were entertaining enough they didn't bring us anything new. By the end of the series, Martian Manhunter is still a survivor of a dead planet who has made Earth his new home and the Hawks are still doomed lovers. 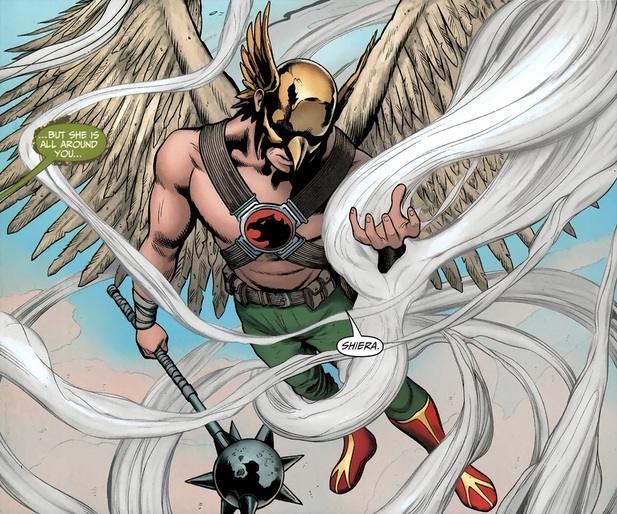 It's particularly disappointing that there were no new insights on Hawkgirl. Like Hawkman, Shiera "Hawkgirl" Hall's personality has mostly remained indistinguishable from that of her Thanagarian counterpart, Shayera "Hawkwoman" Hol. 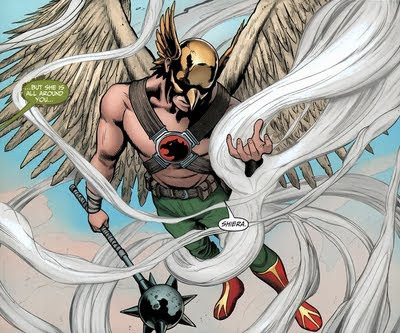 That was until Johns reincarnated her in the body of Kendra Saunders, a girl with no memory of or interest in the eternal love that she and Hawkman share. By the start of Brightest Day, Kendra was Shiera once again and Johns and Tomasi had a golden opportunity to tell us who Shiera really is. Shiera's adventures battling her mother on Hawkworld are fun, and the issue where her and Hawkman get their final chance at happiness cruelly snatched away carries a real emotional punch. But Shiera's personality, that of a passionate warrior with a calming influence on Hawkman, is once again indistinguishable from Shayera. And of course, after all that, she was turned into a fart in the final issue! As far as I'm concerned, the two stars of the series were Aquaman and Firestorm. 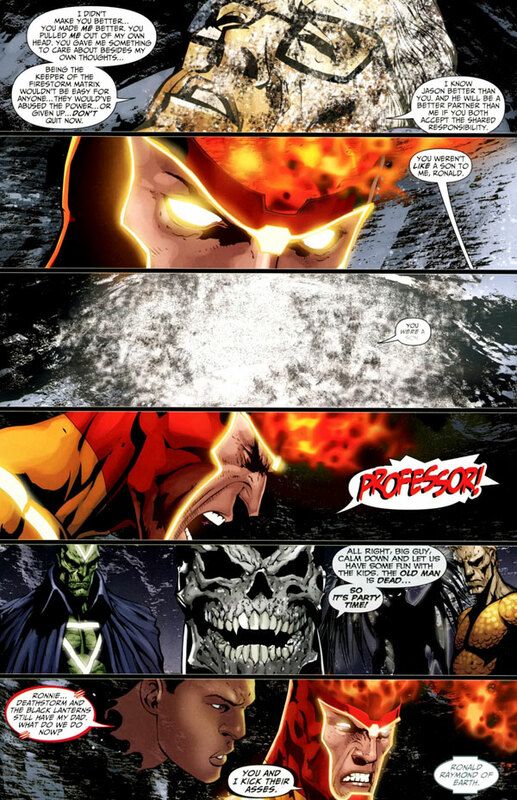 Firestorm was probably the character about whom I knew least but Brightest Day served as an excellent introduction to him. Originally Firestorm was high school jock Ronnie Raymond and nuclear physicist Martin Stein fused together into one nuclear powered hero. By Brightest Day, Ronnie is fused with his successor, high school nerd Jason Rusch and initially they both have good reason to hate each other's guts. It's a great dynamic, the jock and the nerd, forced to share a body. 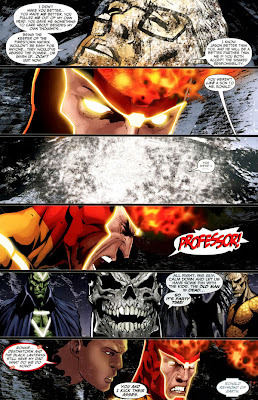 Unfortunately their relationship doesn't quite get the opportunity to blossom into the fully fledged nuclear bromance that it promises, but they do fight two brilliant baddies along the way (Black Lantern Firestorm and the Anti-Monitor) and ultimately are brought together by the death of Martin Stein. It's clear that Stein's bucket is going to be kicked right from the start. Despite this the death still carries emotional weight as the writers do a good enough job at establishing Stein's relationship with the boys, particularly Ronnie. Aquaman's story was easily the most successful. Aquaman is introduced to a new Aqualad, who happens to be the son of Black Manta, the killer of Aquaman's son! It's such a great idea, Manta took Aquaman's son and so Aquaman takes Manta's son under his wing, it fits so well. Another great twist in the tale was the revelation that Mera, Aquaman's other-dimensional wife, was originally sent to kill him! This one revelation was enough in itself to make Mera more interesting than she's been in decades, but she's also shown making excellent use of her powers. At one point she's shown holding back the entire ocean with her mind, reminding us that she's possibly even more powerful than her husband. 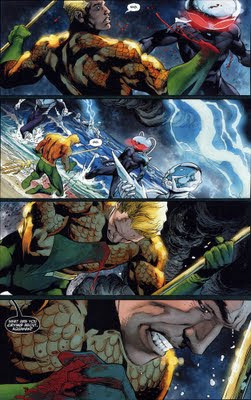 Brightest Day also gives us some of the coolest Aquaman moments since Peter David's legendary run on the character. In the very first issue we're shown proof of what us Aqua-fans have claimed for years, Aquaman is officially bullet-proof! Towards the end of the series we're given one of the best cliffhangers of the series as Aquaman, who was recently given a brand new left hand as part of his resurrection, loses his right hand to Black Manta's blade! Imagine how you'd feel if you regained your left hand and then lost your right hand. 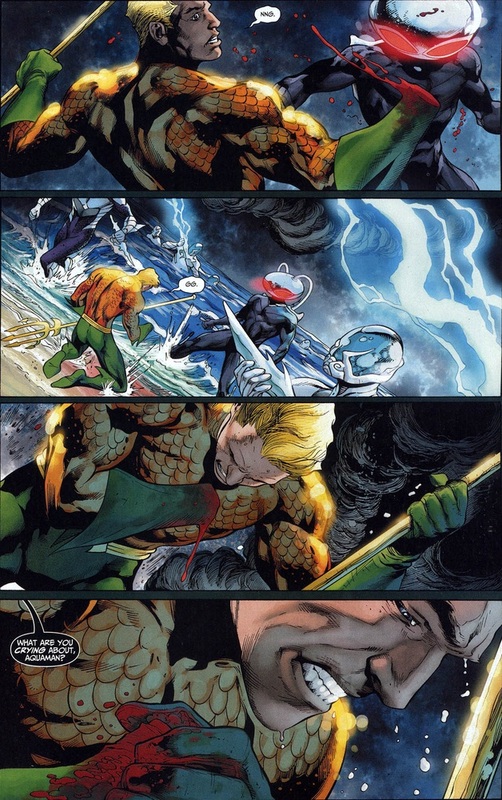 Artist Ivan Reis brilliantly conveys this unprecedented feeling of disappointment and pain on Aquaman's face. I've never seen a super-hero look so gutted! Which brings us to Deadman's tale and the overall arc that links these heroes together. 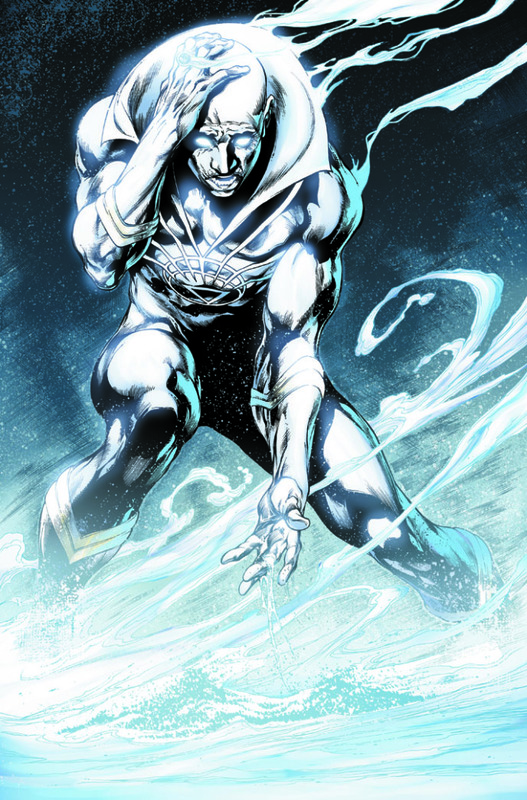 Deadman is now Alive-Man and is being directed by the White Lantern to re-discover the joys of life. I've seen this arc described elsewhere as pointless, since it's obvious that Deadman will return to his deceased state by the end of the series. As far as I'm concerned his inevitable demise makes Deadman's journey all the more poignant, since reuniting with his relatives, falling in love with Dove and re-discovering the pleasure of a cheeseburger gives Deadman something to lose when he re-pops his clogs. Unfortunately Deadman's story is intertwined with the overall arc of the White Lantern and it's purpose, and it's here that Brightest Day fails. The Champion that the White Lantern had Deadman looking for throughout the whole series is Alec Holland. Alec Holland is Swamp Thing, sort of. Way back in 1983 Alan Moore became the new writer of Saga of Swamp Thing. Up until Moore got hold of him, Swamp Thing was scientist Alec Holland, mutated in a fiery explosion into a swamp monster by a bio-restorative formula. In issue #21 Moore established that Swamp Thing was in fact a sentient plant creature who thought he was Alec Holland, the real Holland having died in the explosion. As you can imagine, this revelation came as something of a blow to Swamp Thing and made for some fascinating stories as he reconciled with the fact that he was never a man and uncovered who and what he really was. Initially Swamp Thing was part of the DC Universe but gradually his adventures became completely removed from those of Superman and his Justice League chums. Brightest Day is Swamp Thing's grand return to the DC Universe. Swamp Thing has been taken over by big baddie Nekron and is on a rampage. The White Lantern resurrects Alec Holland and transforms him into a new Swamp Thing, one who actually was once a man, and sends him off to battle Evil Swamp Thing. It just doesn't work for so many reasons. If you're unfamiliar with Alan Moore's Swamp Thing work then you're left feeling unsure why exactly you should give a monkeys that this green guy has just turned up. If you are familiar with Alan Moore's Swamp Thing (like me) then you're left scratching your head in bewilderment as to why DC are flushing everything Moore brought to the character down the toilet. Not only that but they're also flushing everything that original creators Len Wein and Berni Wrightson brought to the character! Originally a big part of what made Swamp Thing interesting was the horror and tragedy of an ordinary man disfigured and transformed into a misunderstood monster. 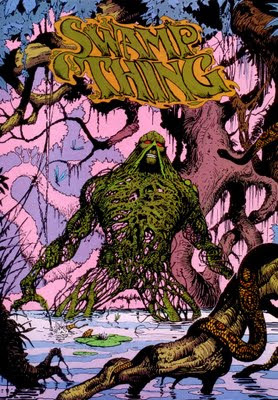 We could all understand and identify with Swamp Thing as he searched for a way to transform back into a man and get revenge on those who caused his fate. Moore took this to the next level, and while 'What if you found out you weren't really you?' is more of an existential question than 'What if you turned into a monster?' it's still a situation that we can imagine ourselves in and we can understand the horror and the tragedy of it. In Brightest Day Holland accepts his new position as muck-monster and Earth elemental straight away and immediately sets off throttling corporate bigwigs. There's no insight into how he feels about it, therefore no horror, no tragedy and no reason why we should care about the character any more. 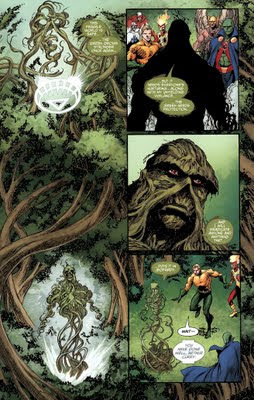 They may go into all this in a future Swamp Thing series or even in the upcoming Brightest Day Aftermath: The Search for Swamp Thing, but based on what we've seen of the character in Brightest Day, why should we bother checking it out? The worst thing about the revelation of Swamp Thing as Earth's champion is that, in the context of Brightest Day as a story in its own right, he comes out of nowhere. Imagine if in Harry Potter and the Deathly Hallows Gandalf turned up at the end to defeat Voldemort. Sure, The Lord of the Rings is brilliant, and it's cool to see Gandalf in anything, and if anyone can defeat Voldemort it's Gandalf, but that doesn't mean that his appearance is good for the story or that it makes a blind bit of sense. My fellow comics bloggers Jason Todd and X-Man have argued that Brightest Day was a complete failure. While their criticisms of the series are very entertaining, I would argue that Brightest Day at least partially succeeds. 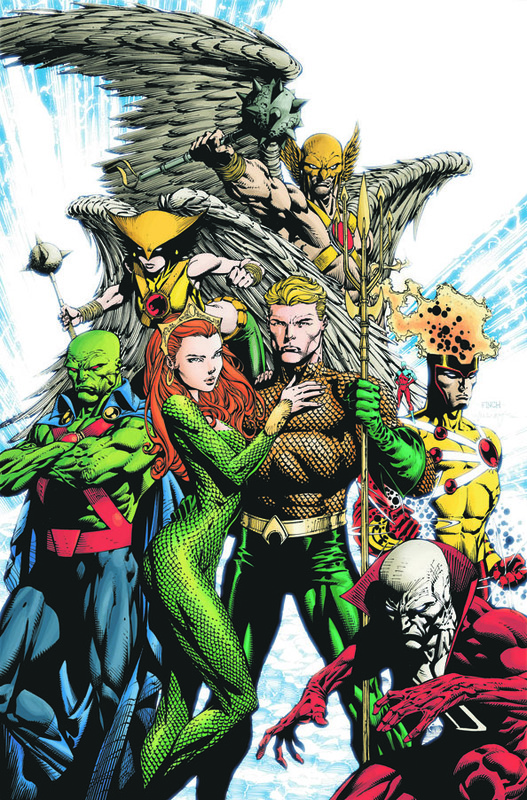 It successfully re-introduces Aquaman and Firestorm back into the DC Universe by telling an entertaining story about them that gives us a clear idea of who they are, introduces us to new aspects of their personalities and leaves us with enough dangling plot threads to carry into a new series. It fails to bring us much that's new about the Hawks, Martian Manhunter and Deadman, but it does at least give us entertaining stories about them. When viewed as a complete story in its own right however, I have to agree with Jason Todd and X-Man, it fails. Everything is wrapped up with the involvement of Swamp Thing, a character that previously had nothing to do with the story. This buggers up the story and it buggers up Swamp Thing, and that's a damn shame.